Happy Wednesday everyone! 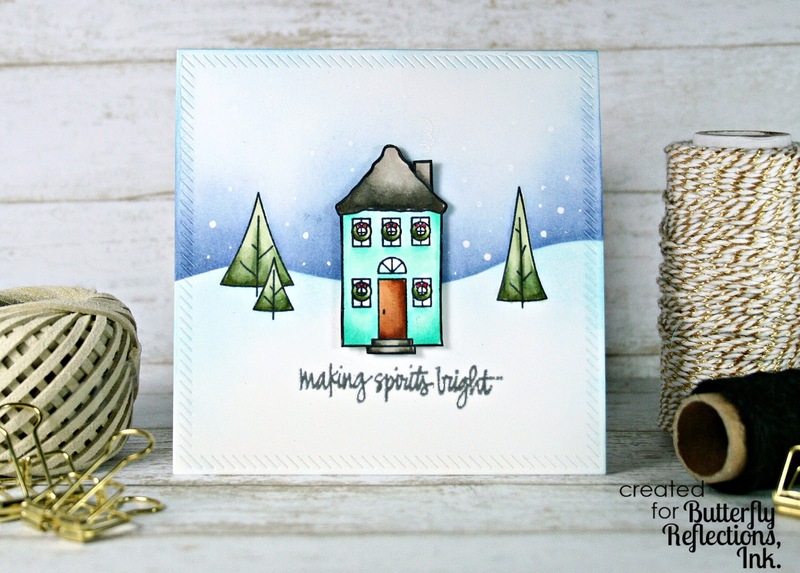 Welcome back to Butterfly Reflections Ink blog! It's Cassie here, and I've got a cute little set of cards to share with you today that would be a perfect addition to a holiday gift, or a sweet set to give someone. These cards were pretty simple to make, so it was easy to make a set of them. I started by die cutting the Diagonal Stitched Square from MFT four times. 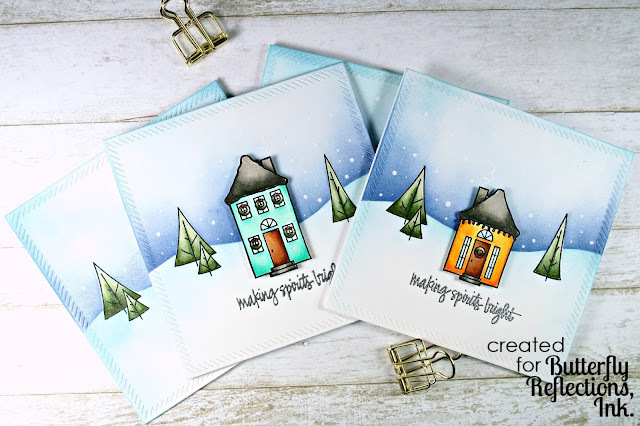 Then I stamped four houses from the Holiday Houses stamp set. I used one twice because I didn't want to use the one that looked like a church. I wanted them to be very flexible for who I could give them to. I colored each house in using my Copics. 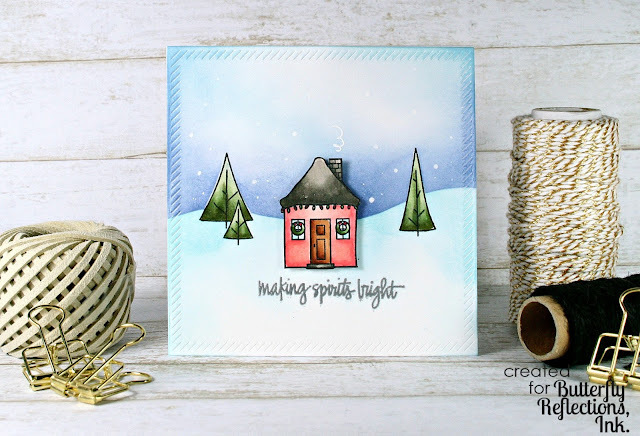 Then I used my Misti Stamping Tool to stamp the trees on each square panel. You wouldn't have to use the Misti, but I found it made the process a lot quicker. I also colored those in with Copics. Nest I took a long post-it and cut a curvy line to create my horizon, I wanted it to look like there were hills of snow behind the homes. I put the post-it down and blended Chipped Sapphire closest to the post-it and Tumbled Glass as it got closer to the top of the square. Next I took the other part of the post-it that I had cut and laid it over the part I had just ink blended. I lightly blended some Tumbled Glass on the bottom half of the card so the snow had some dimension. 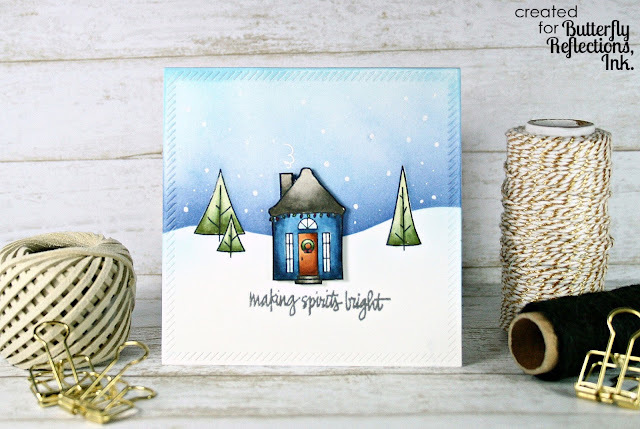 I used my white Gelly Roll pen to add some snow to the sky. 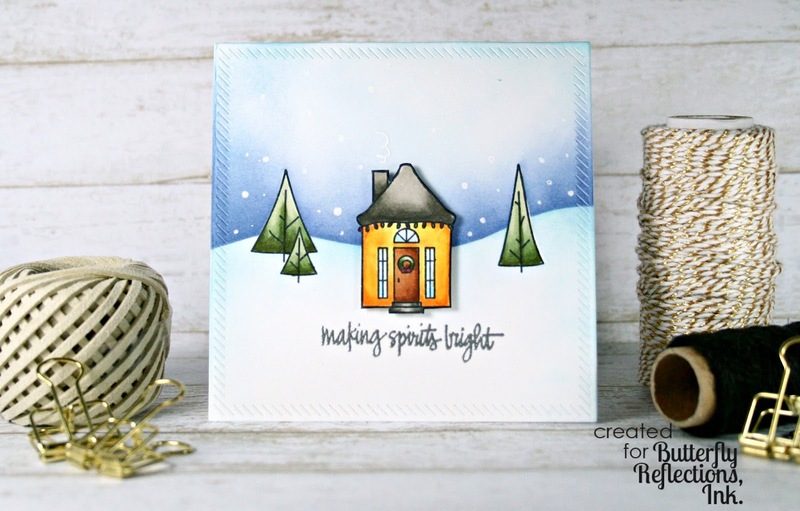 The final touch was to heat emboss my sentiment from the Fa La La La La stamp set from Hero Arts. I love the script fun sentiments in that set. After that I attached the bases to 4x4 cards and that was it! These cuties are ready to be give to some awesome people. Thanks for stopping by! I hope you enjoyed the cards, and I'll see you again soon with another one!